The initial reaction (algorithmic trading) to yesterday’s FOMC minutes from the 1/31 meeting was off of a focus on the fact that the Fed didn’t see runaway inflation. US stocks rallied (S&P +31 to 2747), the US 10-year yield dipped to 2.89%, the DX slid to 89.58, and gold shot up to $1336. Equities sold off (S&P – 15 to 2701), the 10-year yield spiked to 2.957% (fresh 4-year high), the DX rebounded to 90.14, and gold tumbled to $1322.40. Overnight, gold was a little choppy in a range of $1320.90 - $1326.65. It largely faded a firmer dollar, but found support just ahead of the triple bottom at $1319-22 (lows 2/13, 2/14, and 2/21). The DX continued to climb through Asian and early European hours (DX to 90.24, 10-day high), bolstered by weakness in the euro ($1.2299 - $1.2259, miss on German IFO), and sterling ($1.3925 - $1.3856, miss on UK GDP). Gold was also pressured by some hawkish comments by the Fed’s Quarles during early Asian time, saying that inflation running a little below target shouldn't stand in the way of interest rate increases. Later during European time, a dip in the US 10-year bond yield (2.915%), and a rally in the euro ($1.2306, ECB minutes suggest they are considering dropping their easing bias) pushed the DX down to 90, and helped gold recover to $1324. Also, dovish comments from the Fed’s Bullard (“One thing I'm concerned about is if [there's] a bunch of hikes this year Fed policy will turn restrictive,") ahead of the NY opening were gold supportive. Mostly weaker global equities also were helpful to gold, with the NIKKKEI off 1.1%, SCI +2.2% (playing catch up after being closed), Eurozone shares were off 0.5% - 1.0%, but S&P futures were +0.3%. At 8:30 AM, a better than expected reading on US Jobless Claims was better than expected, but the DX only ticked up briefly to 90.07 before resuming its slide. The greenback was pressured by continued strength in the euro ($1.2337), a rebound in the pound ($1.3958), and the US 10-year yield dipping to 2.911%. Gold moved higher, but was capped at the overnight high at $1326.50. At 10AM, a stronger than expected report on Leading Indicators (1.0% vs. exp. 0.7%) helped drive US stocks higher (S&P +22 to 2724), but it failed to lift the dollar. The DX sank further to 89.63, pressured by a climbing euro ($1.2352) and a further slip in the 10-year yield to 2.904%. 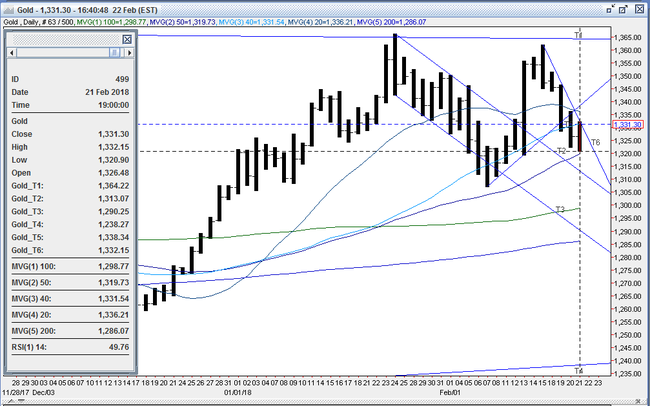 Gold took out resistance at the overnight high in response, and rose to $1331.35. At 11AM, a surprise draw in US oil inventories lifted WTI oil ($61.55 - $63.06), and helped drive US stocks higher (S&P +28 to 2731) into the afternoon. The 10-year yield came off its low to reach 2.915%, and the DX clawed back to 89.88. Gold retreated, but found support at $1328. In the afternoon, US stocks pared earlier gains (S&P ends +3 to 2704, real estate, energy, and material lead gainers) pressured by a further tick up in the 10-year yield (2.928%). 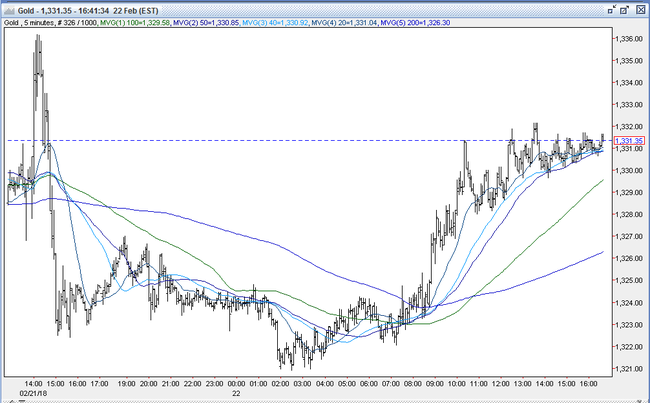 The DX hovered around 89.70 – 89.80, but gold probed higher. The yellow metal reached $1332.15, where resistance at the down trendline from the 2/16 $1362 high and the 40-day moving average held. It was $1331 bid at 4PM with a gain of $5. Open interest was off 3.7k contracts, showing a net of long liquidation from yesterday’s decline. Volume was lower with 263k contracts trading. Bulls were pleased with today’s advance, especially since the US 10-year bond yield made a fresh 4-year high and finished over 2.90%, and stocks gained. They see the dollar’s recent bounce as a minor correction within its year- old down trend, and expect a test of the recent 3-year low at 88.25 from last Friday to propel gold higher. Once initial resistance at $1332 is broken, they’ll look to take out $1336 (50% retracement of down move from 1/25 $1366 high to 2/8 $1307 low), and then $1347 (2/20 high). Having made consecutive lows for the past 5 sessions, bears feel gold’s $41 pullback from the 2/16 $1362 high will continue. Likewise, they expect the DX’s streak of 4 consecutive higher lows to extend, and to pressure gold through initial support at the quadruple bottom at $1319-22. Below here, bears expect to trip more long liquidating stops under the next recent lows at $1316, $1311, and then $1307. All markets will continue to focus on the volatility in the equity and bond markets, geopolitical events, developments with the Trump Administration, corporate earnings, oil prices, and will turn to reports tomorrow on Japanese CPI, German GDP, Eurozone CPI, Baker Hughes Rig Count, Commitment of Traders Report, and comments from the Fed’s Dudley, Rosengren, and Williams for near-term guidance.